Unfortunately, I’ve got one word for you — rain. There’s been too much rain, and we haven’t even turned a wheel yet on our farm. All our soybeans and corn are still out in the field, waiting to be harvested. I certainly hope the rain dries up soon. This kind of weather pattern of persistent rain this time of year is unusual, although my dad, who is 81, says he has seen similar conditions from time to time during his lengthy farming career. Whether we’re getting a few inches of rain at a time or it’s cloudy and misty, day after day of this means we’ll have to work faster and longer when the weather clears up. Just because it stops raining doesn’t mean we can head to the field the next day. It will take at least several days of dry, sunny (preferably breezy) weather to dry out the soil enough that we can run our machinery in the field without the threat of getting stuck in the mud. The later harvest is pushed into the fall, the more risk we face of the weather turning on us in terms of snowfall. Also, very windy days can become a problem this time of year, because they can knock corn plants over, which complicates harvest a lot. I don’t know if this excessive rain will trigger any mold problems the longer the crops stay in the field, but we’re keeping our eye on things. About the only thing I’ve got that has benefited from all this rain are about 20 butterfly milkweed plants I received at the 2018 Farm Progress Show near Boone in August. The plants arrived by mail in September, and I planted them in my gardens a few weeks ago. One of the vendors was promoting the importance of Monarch butterfly habitat, and I want to help create a pollinator-friendly habitat on my farm. Just because harvest is on a “weather delay,” it doesn’t mean we haven’t been busy around here. Please note, by clicking links you will leaving a partially funded checkoff site. Barn quilt fun. I've written about them and photographed them for years. Now, I've painted my first barn quilt! I chose Iowa State University Cyclone red and gold colors in the LeMoyne star pattern. 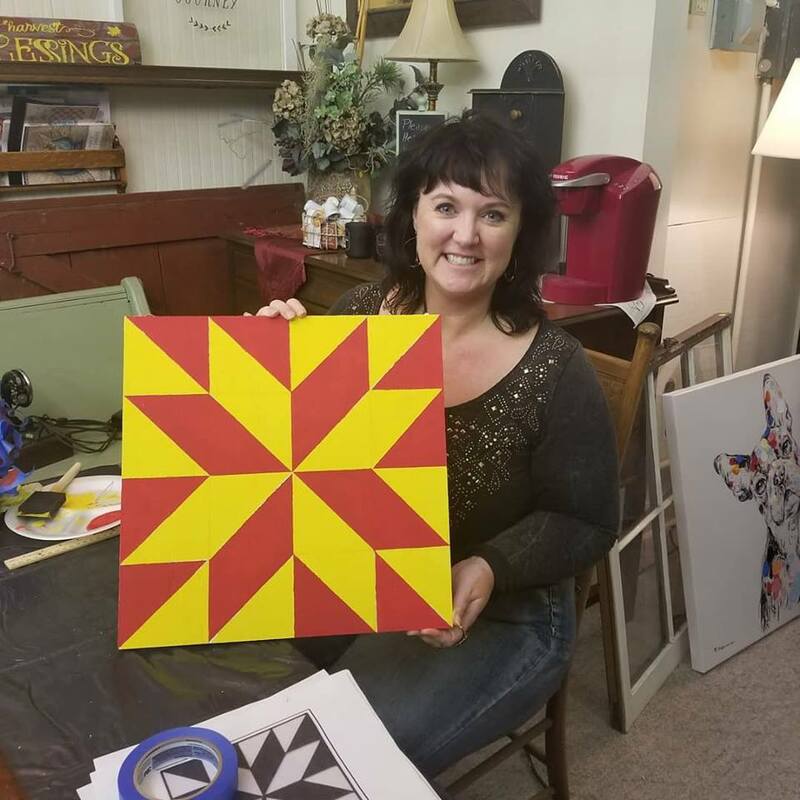 I created my barn quilt at the Paisley Pansie custom framing shop in Lake City, where owner Gail Engleman-Karlen hosts monthly craft nights with a different project each time. I’m not much of a crafter, but I love the fun projects Gail coordinates. I also drove over to Sac City on Sept. 24 for a showing of the documentary “Pieced Together,” which tells the story of how the barn quilt phenomenon started. It was fun to see many Iowa barn quilts in the film, including a number from Sac County. Traveling the Iowa Barn Foundation trail. 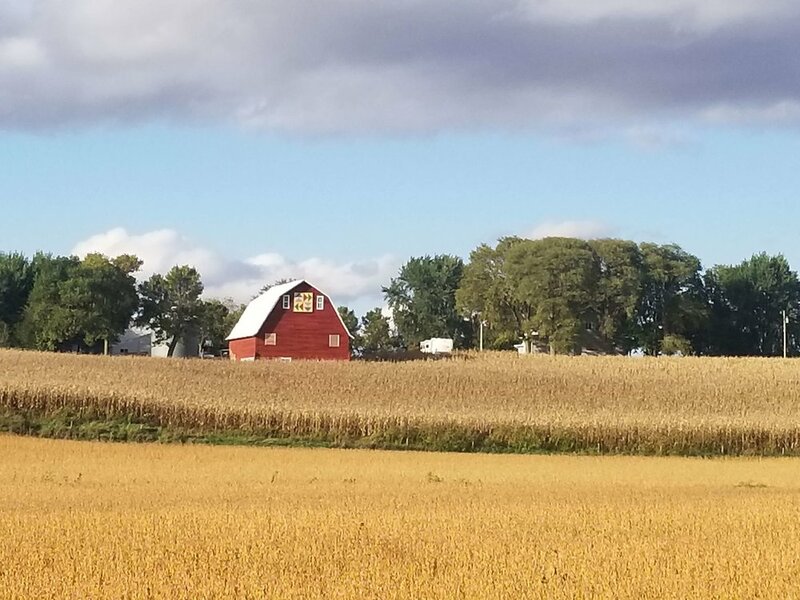 Each year the Iowa Barn Foundation coordinates a self-guided tour of historic barns across Iowa. Each year, I try to visit different counties and am always amazed by the beautiful architecture and intriguing history of these barns. This year, I put the small barn at Oakdale Farms near Ogden at the top of my must-see list. I’m gathering stories for an Iowa ag history book I’m writing for The History Press, which will publish this book in 2019, and I think this barn is the perfect fit. During the tour at Oakdale Farms, I met Sparrows Rene, a beautiful red roan Belgian horse that is a descendant of the legendary Farceur, who lived on this farm northeast of Ogden. C.G. Good bought 7-year-old Farceur, the San Francisco World's Fair champion, for $47,500 in October 1917 (that's more than $1 million in today's dollars!). When Farceur died of colic on Christmas Eve 1921, he was buried in standing upright in his stall, which was a custom of equine champions in his homeland of Belgium. All these years later, Sparrows Rene is housed in the same pen where her ancestor is buried, and Farceur's name can be found on many pedigrees of Belgian horses across America. “As late as the mid-1930s, nine out of 10 rural homes in America had no electric service, according to the National Rural Electric Cooperative Association (NRECA). There were literally two Americas, due to a divide that had been growing for decades. The drudgery of farm life in those pre-electricity years no doubt played a role in younger people leaving the farm for the towns and cities. In the depths of the Great Depression, President Franklin D. Roosevelt established the Rural Electrification Administration (REA). By 1936, the Rural Electrification Act was passed and sparked a whole new era of locally owned rural electric cooperatives. To help farm families learn about electricity and how to use it safely, REA hired advisors like Louisan Mamer, a home electrification specialist who had grown up on a farm in southern Illinois. Starting in 1937, Mamer and her colleagues traveled across Iowa and around the nation with their “electric circus.” Read more here. Giving back to Living History Farms. When Living History Farms (LHF) reached out to me late this summer about donating a “dinner on the farm” event at my family’s Century Farm for an upcoming LHF fundraiser, I didn’t think twice. Yes! I believe in the mission of LHF in Urbandale, which welcomes between 100,000 and 110,000 visitors each year. This interactive, 500-acre outdoor museum tells the amazing 300-plus year story of how Iowans transformed the fertile prairies of the Midwest into the most productive farmland in the world. I also said yes because I spent the summer between my junior and senior years at Iowa State University working as an intern at LHF. I was a historical interpreter who helped guests learn about life on the 1900 farm, the 1870s Flynn mansion in the town of Walnut Hill and the veterinary clinic in Walnut Hill. I dressed in the period clothing (yes, long dresses, sunbonnets and all) and learned how to live off the grid. I can milk a cow by hand, make homemade butter, sew an apron on a treadle sewing machine and whip up a batch of cookies in a wood-fired cookstove. That’s why I’m proud to support LHF’s Farmstasia, which LHF describes as a “casually elegant fundraising dinner and auction.” Proceeds from Farmstasia support LHF’s extensive education and outreach programs, which serve nearly 23,000 students annually. I donated a signed copy of my “Culinary History of Iowa” book and will host the winner of the “dinner on the farm” and their guests at my family’s farm during harvest. I’ll treat them to a home-cooked meal and maybe even a combine ride or two. Awesome apples. If you’d like a taste of what I’ll be cooking up for the LHF “dinner on the farm” winner, I’m still deciding on the menu but think this Chunky Apple Cake with Butterscotch Sauce might be a strong contender for dessert. 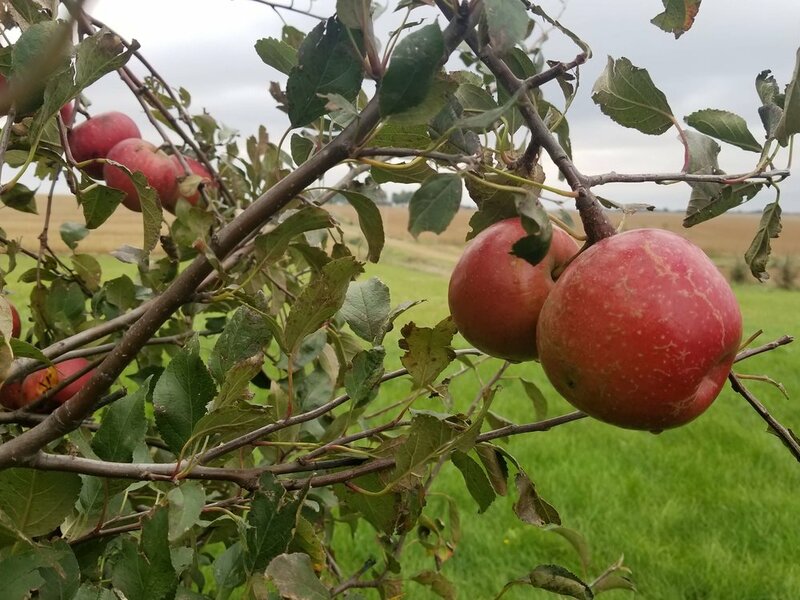 It’s a good fit, since I have an abundant crop of apples in my orchard this fall, including Sweet Sixteen apples, Haralson apples (with a slightly tart flavor — great for pies!) and big, frost-hardy Wolf River apples. Enjoy the fall, with all its exceptional flavors and colors. In a large bowl, cream the butter, sugar and vanilla. Add eggs, one at a time, beating well after each addition. Combine flour, cinnamon, nutmeg, salt and baking soda; gradually add to creamed mixture and mix well (batter will be stiff). Stir in apples until well combined. Spread into a greased 9 x 13 baking dish. Bake at 350° for 40-45 minutes or until top is lightly browned and springs back when lightly touched. Cool for 30 minutes before serving. Meanwhile, in a small saucepan, combine brown sugar and butter. Cook over medium heat until butter is melted. Gradually add cream. Bring to a slow boil over medium heat, stirring constantly. Remove from heat. Serve with cake.